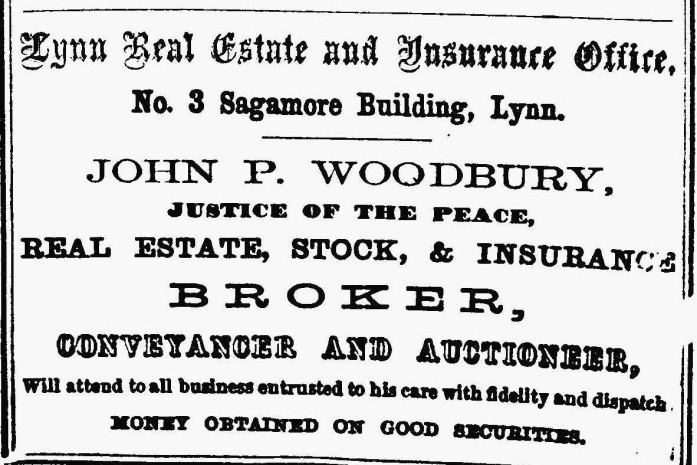 History ⋆ Farquhar & Black Insurance Agency, Inc.
January 1, 1854 – John P. Woodbury opens a real estate and insurance office in Lynn, Massachusetts, in the old Sagamore building. Representing Holyoke Mutual and Aetna Insurance Company, John P. Woodbury was the 31st Independent Agent Aetna appointed. 1857 – Woodbury reorganizes his firm as Woodbury & Co., composed of John P. Woodbury, N. Everett Silsbee & Charles J. Pickford. Silsbee & Pickford both started as clerks for Mr. Woodbury. 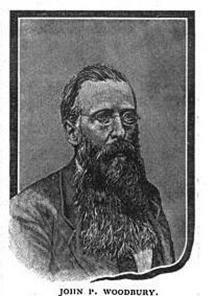 December 31, 1867 – Mr. Woodbury retires. When he retired his office was the second largest business of its type in the state. Mr. Woodbury proceeded to go abroad with his family. With Mr. Woodbury retired, the firm is renamed, Silsbee & Pickford. December 19, 1869 – John M. Farquhar born in Greenock, Scotland. April 1, 1882 – Due to poor health, Mr. Pickford retired and Charles N. Stevens was admitted. Once again the firm changed its name, this time to Silsbee and Stevens. August 6, 1884 – Charles W. Geer takes over the partnership interest of Mr. Stevens and the company becomes known as Silsbee & Geer. It was said of Mr. Geer that “Good business with Mr. Geer did not necessarily mean volume but quality, and everything that he said and everything he dealt in was, in his belief, exactly as he represented it to be.” We try to be true to his ideal to this day. December 1, 1893 – The firm of Baker, Marshman & Baker is merged into Silsbee and Geer. The agency’s name changes to Silsbee, Baker & Geer. 1895 – John M Farquhar arrives in Lynn, MA. July 1898 – Official Directory of the New England Telephone and Telegraph Co. lists the phone number of Silsbee, Baker & Geer as 284. Cutting-edge technology for more than 110 years! Fire insurance policy issued by Silsbee, Baker & Geer that expires on February 11, 1896 – $130.00 of building coverage for $3.00. At that rate a $300,000 building today would cost $6,923.00! October 17, 1900 – John M. Farquhar becomes a naturalized citizen of the United States. February 27, 1903 – Jerome Ingalls & Co., another prominent real estate and insurance office joined with Silsbee, Baker & Geer and the company became known as Silsbee, Baker, Geer & Ingalls. 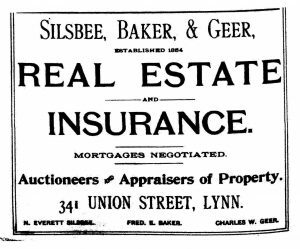 December 1, 1906 – After fifty years as one of the leading fire insurance and real estate men in the city of Lynn, N. Everett Silsbee retires and the firm becomes Baker, Geer & Ingalls. 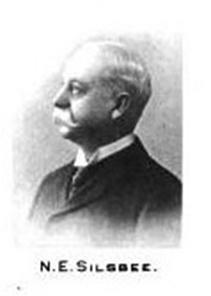 January 25, 1909 – Fred E. Baker purchases the Insurance business of Howard Mudge Newhall. August 1, 1911 – John M. Farquhar, Fred L. Norris, and A. Shirley Black join the firm and it becomes Geer, Farquhar, Norris & Black. October 7, 1912 – “Mr. 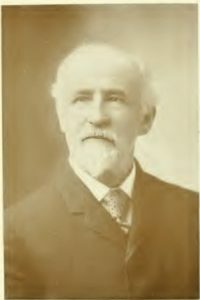 Geer was obliged to retire from all active participation in business affairs on account of ill health” and the firm became known as Farquhar, Norris & Black. April 1, 1913 – Farquhar Norris & Black purchases the insurance agency of Frank H. Frizzell, but remained as Farquhar, Norris & Black! 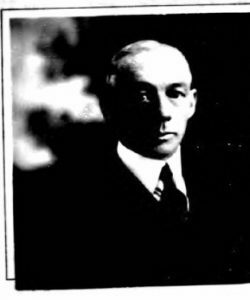 July 27, 1925 – Fred L. Norris retires and the firm name changes to FARQUHAR & BLACK. July 1, 1927 – Francis N. Haley and Richard P. Breed join Farquhar & Black as partners. December 31, 1936 – Francis N. Haley retires. John M. Farquhar, A. Shirley Black, and Richard P. Breed continue as partners in Farquhar & Black. June 19, 1939 – Ernest P. Lane Jr. and Henry A. Pevear (Son-in-law of A. Shirley Black) are taken into as partners of Farquhar & Black. September 22, 1939 – Farquhar & Black purchases the insurance business of Walter R. Stahler. June 26, 1940 – Farquhar & Black purchases the insurance business of Ernest M. Folger. December 31, 1943 – A. Shirley Black retires. John M. Farquhar, Richard P. Breed, Ernest P. Lane Jr. & Henry A. Pevear continue as partners in Farquhar & Black. September 26, 1945 – Farquhar & Black purchases the insurance business of Fred M. Farrell. April 1, 1947 – Richard P. Breed becomes majority partner of Farquhar & Black. 1948 – John M. Farquhar dies. October 15, 1948 – Farquhar & Black purchases the 17.5% interest of John M. Farquhar from his estate. February 21, 1948 – Fred Miller sells his insurance business to Farquhar & Black. July 1, 1955 – Richard P. Breed Jr. & Douglas F. Allen combine their business with that of Farquhar & Black and are admitted as partners. The five partners are now: Richard P. Breed; Henry A Pevear; Ernest P. Lane; Richard P. Breed Jr. & Douglas F. Allen. January 1, 1956 – Insurance business of Thomas J. Bresnahan purchased by Farquhar & Black. January 3, 1960 – Insurance business of John C. Fox d/b/a Johnson & Fox acquired by Farquhar & Black. January 2, 1963 – Douglas F. Allen & Richard P. Breed Jr. become the majority partners of Farquhar & Black. August 31, 1963 – Farquhar & Black purchases the insurance business of Harold L. Vose. April 1, 1965 – Henry A. Pevear retires and sells his 15% interest to the remaining partners of Farquhar & Black. October 28, 1965 – Ernest P. Lane retires and sells his 29.4% interest to Douglas F. Allen & Richard P. Breed Jr.
January 31, 1967 – Farquhar & Black purchases the Insurance business of the Vernon A. Martin Insurance Agency, Inc.
July 1, 1968 – Richard P. Breed gives his remaining interest in Farquhar & Black to Douglas F. Allen and Richard P. Breed Jr. The two brothers-in-law become the sole partners in Farquhar & Black. August 1, 1970 – Richard P. Breed Jr. & Douglas F. Allen form John F. McCarthy Ins. Agency, Inc. and use that corporation as a vehicle to purchase the insurance business of the John F. McCarthy Insurance Agency, Inc. Included in that transaction are the agencies of Thomas Malcolm (Shafner- Malcolm Insurance Agency) and Thomas F. Quinn (Weber & Quinn Insurance Agency). June 1976 – Edward M. Breed, is offered a summer job by his father, Richard, at Farquhar & Black ‘to study and get his Massachusetts insurance broker’s license’. September 1976 – Edward M. Breed passes the Massachusetts insurance broker exam on his first attempt. October 1979 – Edward M. Breed begins working full time at Farquhar & Black. August 8, 1980 – Together with Laurence D. Cobbett, Messrs. Allen & Breed form Swampscott Insurance Agency, Inc. and purchase the Bufalino Insurance Agency, Inc. from William H Bufalino. Combining the Laurence D. Cobbett Insurance Agency with the Bufalino Insurance Agency, they have their first office outside of Lynn. 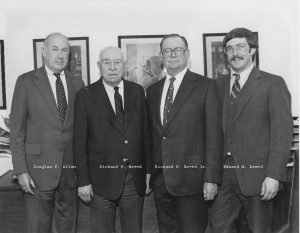 July 2, 1984 – Farquhar & Black purchases the insurance business of John E. Moulton and Sons, Inc. from Albert E. Clark Jr.
February 28, 1987 – Laurence D. Cobbett dies unexpectedly. August 1, 1990 – Swampscott Insurance Agency is consolidated back into the Lynn office of Farquhar & Black. August 12, 1992 – Farquhar & Black purchases the business of Gilberg Insurance Agency, Inc.
November 4, 1994 – Douglas F. Allen retires. Edward M. Breed, along with Jeffrey A. Kilgore and Cyrus A. Kilgore form Farquhar & Black Insurance Agency, Inc. and purchase his 50% interest in Farquhar & Black. January 1, 1998 – Edward M. Breed purchases the interests of Messrs. Kilgore in Farquhar & Black Insurance Agency, Inc.., becoming the sole shareholder. January 1, 2002 – Richard P. Breed Jr. retires. Farquhar & Black Insurance Agency, Inc. purchases the remaining 50% interest in Farquhar & Black. August 1st, 2002 – Farquhar & Black Insurance Agency, Inc., purchases Moran & Cassidy Insurance Agency, Inc., from Joseph F. Moran. December 2, 2009 – Farquhar & Black Insurance Agency, Inc. purchases the insurance business of Elizabeth S. Puleo. November 11, 2015 – Farquhar & Black publishes it’s first mobile app.